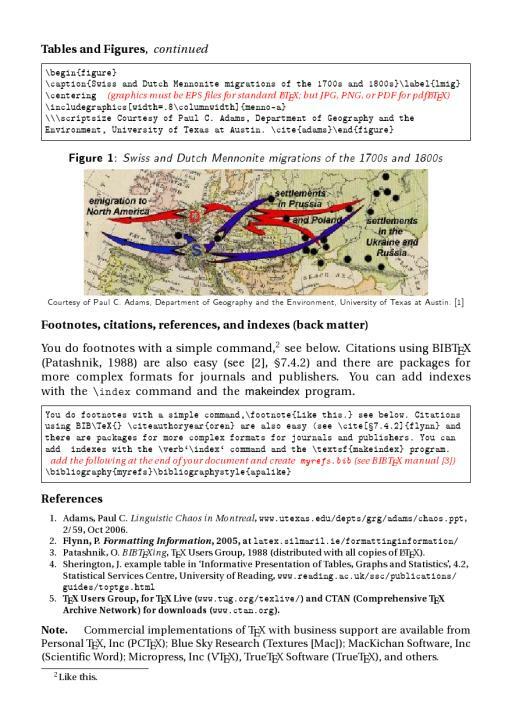 This is the 1 October 2009 revision of the Guide. 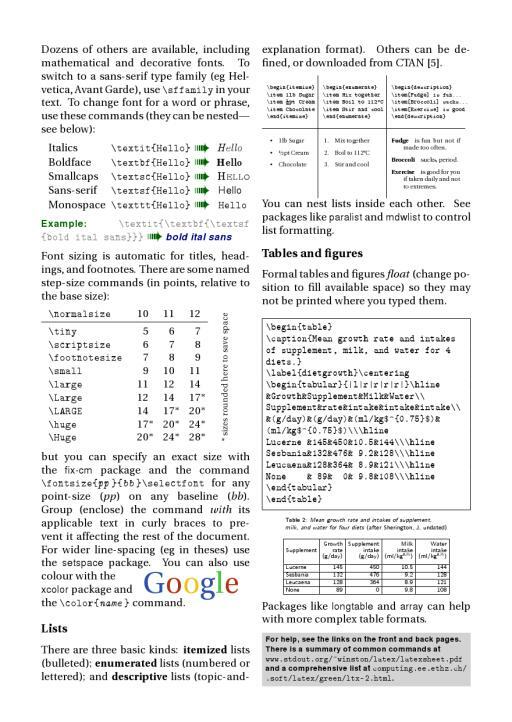 It is designed for printing on A4 paper, double-sided, and folding once to A5. This revision corrects some minor typographical inconsistencies and rephrases some descriptions for greater clarity. 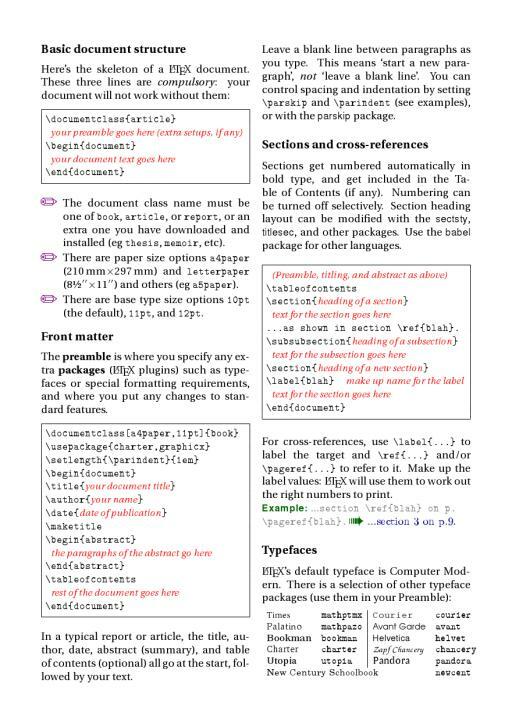 This is the Very Short Guide to LaTeX, a 4pp folder designed as an aide-mémoire for people who have just done a course in LaTeX and need something by them on their desk the next day to refresh their memories. It is not intended as a substitute for full documentation. 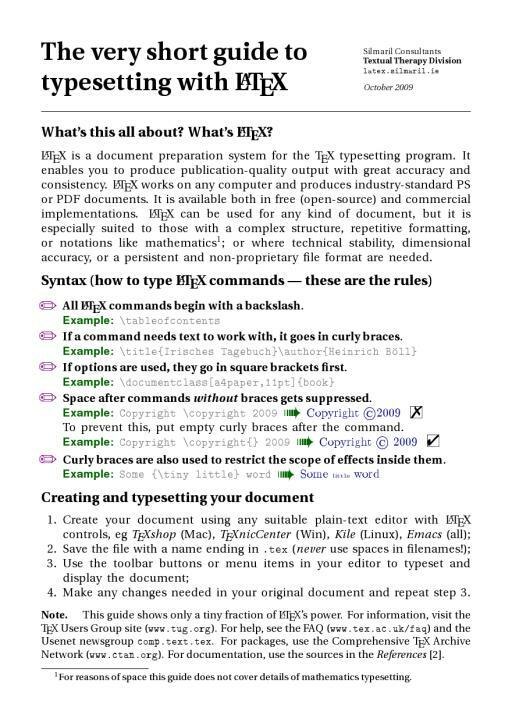 An earlier (Jan 2008) version was typeset on two A4 landscape pages ready to print, but this restricted the ways people wanted to print it, so this version is set as four normal A5 pages, leaving the imposition up to your printer driver. The weird value of 30cm appears to be due to a bug in pstops (and in psbook: it ought to have been possible to use psbook and psnup for this, but that method does not allow for offsetting). The page margins are set to 12mm, because many desktop inkjet printers cannot print the bottom 12mm of a sheet; it was felt best to equalise this all round, at the small expense of making the printable area slightly smaller. If you have been maintaining a mirror or other copy of this document, please update it with this version and delete the previous files.